Bermuda is known for its northernmost coral reef system, located at 32°24′N 64°48′W﻿ / ﻿32.4°N 64.8°W. The presence of coral reefs at this high latitude is due to the proximity of the Gulf Stream. 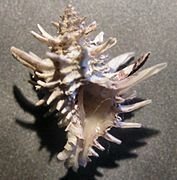 Bermuda coral species represent a subset of those found in the greater Caribbean. Another cause for the death of coral reefs is bioerosion. Various fishes graze corals and change the morphology of coral reefs making them more susceptible to other threats. Only the algae growing on dead corals is eaten and the live ones are not. 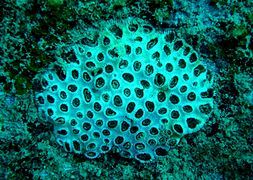 However, this act still destroys the top layer of coral substrate and makes it harder for the reefs to sustain. ^ a b Cesar, H.J.S. ; Burke, L.; Pet-Soede, L. (2003). The Economics of Worldwide Coral Reef Degradation. The Netherlands: Cesar Environmental Economics Consulting. p. 4. (pdf: link). Retrieved September 21, 2013. ^ a b Costanza, Robert; Ralph d'Arge; Rudolf de Groot; Stephen Farber; Monica Grasso; Bruce Hannon; Karin Limburg; Shahid Naeem; Robert V. O'Neill; Jose Paruelo; Robert G. Raskin; Paul Sutton; Marjan van den Belt (May 15, 1997). "The value of the world's ecosystem services and natural capital". Nature. 387 (6630): 253–260. Bibcode:1997Natur.387..253C. doi:10.1038/387253a0. ^ Webster, Jody M.; Clague, David A.; Riker-Coleman, Kristin; Gallup, Christina; Braga, Juan C.; Potts, Donald; Moore, James G.; Winterer, Edward L.; Paull, Charles K. (January 1, 2004). "Drowning of the −150 m reef off Hawaii: A casualty of global meltwater pulse 1A?". Geology. 32 (3): 249. Bibcode:2004Geo....32..249W. doi:10.1130/G20170.1. ^ Jell JS, Flood PG (April 1978). "Guide to the geology of reefs of the Capricorn and Bunker groups, Great Barrier Reef province". Papers, Department of Geology. 8 (3). pp. 1–85, pls. 1-17. Retrieved June 28, 2018. ^ Sherman, C.D.H. (2006). The Importance of Fine-scale Environmental Heterogeneity in Determining Levels of Genotypic Diversity and Local Adaption (PDF) (Ph.D. thesis). University of Wollongong. Archived from the original (PDF) on July 24, 2008. Retrieved June 7, 2009. ^ Nothdurft, L.D. (2007). Microstructure and early diagenesis of recent reef building Scleractinian corals, Heron Reef, Great Barrier Reef: Implications for palaeoclimate analysis (PDF) (Ph.D. thesis). Queensland University of Technology. Retrieved June 7, 2009. ^ Wilson RA (August 9, 2007). "The Biological Notion of Individual". Stanford Encyclopedia of Philosophy. Retrieved June 7, 2009. ^ Chappell, John (July 17, 1980). "Coral morphology, diversity and reef growth". Nature. 286 (5770): 249–252. Bibcode:1980Natur.286..249C. doi:10.1038/286249a0. ^ Jackson, Jeremy B. C. (July 1, 1991). "Adaptation and Diversity of Reef Corals". BioScience. 41 (7): 475–482. doi:10.2307/1311805. JSTOR 1311805. ^ Rougerier, F (1998). "The functioning of coral reefs and atolls: from paradox to paradigm". In Jost, Christian (ed.). The French-Speaking Pacific: Population, Environment and Development Issues. Boombana Publications. ISBN 978-1-876542-02-3. (pdf: link). ^ Crossland, CJ (1983). "Dissolved nutrients in coral reef waters". In Barnes, D. J. (ed.). Perspectives on Coral Reefs. Australian Institute of Marine Science. pp. 56–68. ISBN 9780642895851. ^ Hatcher, Bruce Gordon (May 1, 1988). "Coral reef primary productivity: A beggar's banquet". Trends in Ecology & Evolution. 3 (5): 106–111. doi:10.1016/0169-5347(88)90117-6. PMID 21227159. ^ Nowak, Rachel (September 21, 2002). "Corals play rough over Darwin's paradox". New Scientist (2361). ^ Glynn, P.W. (1990). Dubinsky, Z. (ed.). Ecosystems of the World v. 25-Coral Reefs. New York, NY: Elsevier Science. ISBN 978-0-444-87392-7. ^ Murphy, James W.A. ; Richmond, Robert H. (April 19, 2016). "Changes to coral health and metabolic activity under oxygen deprivation". PeerJ. 4: e1956. doi:10.7717/peerj.1956. ISSN 2167-8359. PMC 4841221. PMID 27114888. ^ "THE EFFECTS OF TERRESTRIAL RUNOFF OF SEDIMENTS, NUTRIENTS AND OTHER POLLUTANTS ON CORAL REEFS" (PDF). Retrieved December 5, 2015. ^ a b Westbrook, Charley E.; Ringang, Rory R.; Cantero, Sean Michael A.; Toonen, Robert J.; Team, HDAR & TNC Urchin (September 15, 2015). "Survivorship and feeding preferences among size classes of outplanted sea urchins,Tripneustes gratilla, and possible use as biocontrol for invasive alien algae". PeerJ. 3: e1235. doi:10.7717/peerj.1235. ISSN 2167-8359. PMC 4579015. PMID 26401450. ^ Conklin, Eric J.; Smith, Jennifer E. (November 1, 2005). "Abundance and Spread of the Invasive Red Algae, Kappaphycus spp., in Kane'ohe Bay, Hawai'i and an Experimental Assessment of Management Options". Biological Invasions. 7 (6): 1029–1039. doi:10.1007/s10530-004-3125-x. ISSN 1387-3547. ^ Li, Min; Fry, B.G. ; Kini, R. Manjunatha (January 1, 2005). "Eggs-Only Diet: Its Implications for the Toxin Profile Changes and Ecology of the Marbled Sea Snake (Aipysurus eydouxii)". Journal of Molecular Evolution. 60 (1): 81–89. Bibcode:2005JMolE..60...81L. doi:10.1007/s00239-004-0138-0. PMID 15696370. ^ Voris, Harold K. (January 1, 1966). "Fish Eggs as the Apparent Sole Food Item for a Genus of Sea Snake, Emydocephalus (Krefft)". Ecology. 47 (1): 152–154. doi:10.2307/1935755. JSTOR 1935755. ^ McClenachan, Loren; Jackson, Jeremy BC; Newman, Marah JH (August 1, 2006). "Conservation implications of historic sea turtle nesting beach loss". Frontiers in Ecology and the Environment. 4 (6): 290–296. doi:10.1890/1540-9295(2006)4[290:CIOHST]2.0.CO311'1;2 (inactive October 24, 2018). ^ Ferarrio, F.; et al. (2014). "The effectiveness of coral reefs for coastal hazard risk reduction and adaptation". Nature Communications. 5:3794: 3794. doi:10.1038/ncomms4794. PMC 4354160. PMID 24825660. Retrieved August 17, 2018. ^ Beck, M.; et al. (2018). "The global flood protection savings provided by coral reefs". Nature Communications. 9:2186. Retrieved August 17, 2018. ^ "Caribbean coral reefs may disappear within 20 years: Report". IANS. news.biharprabha.com. Retrieved July 3, 2014. ^ Liz Minchin (April 8, 2013). "Air pollution casts a cloud over coral reef growth". The Conversation. The Conversation Media Group. Retrieved April 9, 2013. ^ Ritter, Karl (December 8, 2010). 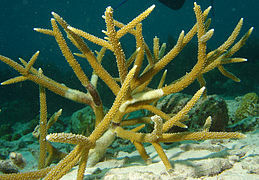 −goal-coral-reefs.html "Climate goal may spell end for some coral reefs". Associated Press. ^ Abrego, D.; Ulstrup, K. E; Willis, B. L; van Oppen, M. J.H (October 7, 2008). "Species-specific interactions between algal endosymbionts and coral hosts define their bleaching response to heat and light stress". Proceedings of the Royal Society B: Biological Sciences. 275 (1648): 2273–2282. doi:10.1098/rspb.2008.0180. ISSN 0962-8452. PMC 2603234. PMID 18577506. ^ Stierwalt, Everyday Einstein Sabrina. "Why Is Hawaii Banning Sunscreen?". Scientific American. Retrieved August 19, 2018. ^ Barkley, Hannah C.; Cohen, Anne L.; Mollica, Nathaniel R.; Brainard, Russell E.; Rivera, Hanny E.; DeCarlo, Thomas M.; Lohmann, George P.; Drenkard, Elizabeth J.; Alpert, Alice E. (November 8, 2018). "Repeat bleaching of a central Pacific coral reef over the past six decades (1960–2016)". Communications Biology. 1 (1). doi:10.1038/s42003-018-0183-7. ISSN 2399-3642. ^ Ewa Magiera; Sylvie Rockel (July 2, 2014). "From despair to repair: Dramatic decline of Caribbean corals can be reversed". Retrieved June 8, 2015. ^ Mallikarjun, Y. (December 10, 2014). "Satellites to assess coral reef health". The Hindu. Retrieved December 13, 2014. ^ "World Heritage List". UNESCO. Retrieved December 18, 2016. ^ "A biodiversity strategy for the Great Barrier Reef". Great Barrier Reef Marine Park Authority, Australian Government. Retrieved September 20, 2013. ^ Rinkevich, B (2008). "Management of coral reefs: We have gone wrong when neglecting active reef restoration" (PDF). Marine Pollution Bulletin. 56 (11): 1821–1824. doi:10.1016/j.marpolbul.2008.08.014. PMID 18829052. Archived from the original (PDF) on May 23, 2013. ^ Fowler, Ashley M; Jørgensen, Anne-Mette; Svendsen, Jon C; Macreadie, Peter I; Jones, Daniel OB; Boon, Arjen R; Booth, David J; Brabant, Robin; Callahan, Emily (July 3, 2018). "Environmental benefits of leaving offshore infrastructure in the ocean". Frontiers in Ecology and the Environment. doi:10.1002/fee.1827. hdl:11250/2505018. ISSN 1540-9295. ^ "Superglue used for placement of coral". coralgarden.co.uk. May 8, 2009. Archived from the original on May 8, 2009. Retrieved November 8, 2011. ^ "Needle and thread use with soft coral". coralgarden.co.uk. May 8, 2009. Archived from the original on May 8, 2009. Retrieved November 8, 2011. African coral reefs are coral reefs mainly found along the south and east coasts of Africa. The east coast corals extend from the Red Sea to Madagascar in the south, and are an important resource for the fishersmen of Kenya, Tanzania, Mozambique and Madagascar. As with coral reefs elsewhere, African coral reefs are more biologically diverse than the surrounding ocean, and support species such as the mantis shrimp, potato grouper, humphead wrasse and maxima clam, as well as many seaweeds and corals. On the east coast, temperatures average about 26 °C (79 °F) over the year. The average rainfall is highest between January to April, at about 300 millimetres (12 in), and lowest during August to November, at about 100 millimetres (3.9 in). There are multiple threats to the reefs, such a tourist diving and damaging the corals, or taking samples. Then there are industrial run-offs and pollutants, untreated sewage and the increasing sediment flows in rivers that threaten all of the coastal ecosystems. The reef is also threatened by climate change. Due to global warming, the sea surface temperature increases and in 1997/98 a particularly severe 'El Nino' killed 90 percent of corals on the reef. The CORDIO (COral Reef Degradation in the Indian Ocean) NGO have set up an East African task force to monitor the reef's management. Coral aquaculture, also known as coral farming or coral gardening, is the cultivation of corals for commercial purposes or coral reef restoration. Aquaculture is showing promise as a tool for restoring coral reefs, which are dying off around the world. The process protects young corals while they are most at risk of dying. Small corals are propagated in nurseries then replanted on the reef.Coral farmers live near the reefs they farm and work for reef conservation or for income. Coral is also farmed by scientists for research, by businesses for the live and ornamental coral trade, and by private aquarium hobbyists. An atoll ( , , , , or ), sometimes called a coral atoll, is a ring-shaped coral reef including a coral rim that encircles a lagoon partially or completely. There may be coral islands or cays on the rim. The coral of the atoll often sits atop the rim of an extinct seamount or volcano which has eroded or subsided partially beneath the water. The lagoon forms over the volcanic crater or caldera while the higher rim remains above water or at shallow depths that permit the coral to grow and form the reefs. For the atoll to persist, continued erosion or subsidence must be at a rate slow enough to permit reef growth upward and outward to replace the lost height. The Census of Coral Reefs (CReefs) is a field project of the Census of Marine Life that surveys the biodiversity of coral reef ecosystems internationally. The project works to study what species live in coral reef ecosystems, to develop standardized protocols for studying coral reef ecosystems, and to increase access to and exchange of information about coral reefs scattered throughout the globe. The CReefs project uses the implementation of autonomous reef-monitoring structures (ARMS) to study the species that inhabit coral reefs. These structures are placed on the sea floor in areas where coral reefs exist, where they are left for one year. 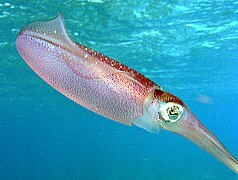 At the end of the year, the ARMvS is pulled to the surface, along with the species which have inhabited it, for analysis. Coral reefs are thought to be the most organically different of all marine ecosystems. Major declines in key reef ecosystems suggest a decline in reef population throughout the world due to environmental stresses. The vulnerability of coral reef ecosystems is expected to increase significantly in response to climate change. The reefs are also being threatened by induced coral bleaching, ocean acidification, sea-level rise, and changing storm tracks. Reef biodiversity could be in danger of being lost before it is even documented, and researchers will be left with a limited and poor understanding of these complex ecosystems. In an attempt to enhance global understanding of reef biodiversity, the goals of the CReefs Census of Coral Reef Ecosystems were to conduct a diverse global census of coral reef ecosystems. And increase access to and exchange of coral reef data throughout the world. Because coral reefs are the most diverse and among the most threatened of all marine ecosystems, there is great justification to learn more about them. The Coral Reef Alliance (CORAL) is a nonprofit organization based in Oakland, California, that partners with local reef communities around the world to protect coral reefs. The Coral Reef Alliance's (CORAL) mission is uniting communities to save coral reefs. Working with people around the world—from fishermen to government leaders, divers to scientists, Californians to Fijians—the Coral Reef Alliance protects our most valuable and threatened ecosystem. We lead holistic conservation programs that improve coral reef health and resilience and are replicated across the globe. At the heart of our work are Adaptive Reefscapes – networks of healthy reefs that can adapt to climate change because they are diverse, connected and large. Although they cover less than 0.1 percent of the earth’s surface, coral reefs are the most biodiverse marine ecosystems in the world. 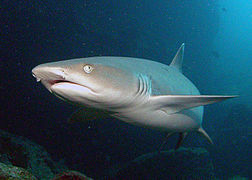 They are also among the most threatened. Today, coral reefs face multiple stressors at different scales. When global threats like warming waters combine with direct threats like overfishing and water pollution, it severely compromises the ability of corals to grow, reproduce and thrive. As much as one-third of all reef-building corals are at risk of extinction. Scientists predict that all corals will be threatened by 2050, with 75 percent facing high to critical threat levels. Coral Reef Drive, also known as South 152nd Street, is a 9.6-mile-long (15.4 km) main east–west road south south of Miami in Miami-Dade County, Florida, United States. It serves to connect the communities of Country Walk and Richmond Heights with Palmetto Bay. State Road 992 (SR 992) is designated along the 2.462-mile-long (3.962 km) section of Coral Reef Drive between the Homestead Extension of Florida's Turnpike and US 1. The Coral Reef Restaurant is a themed seafood restaurant in The Seas with Nemo & Friends, which is located in Epcot's Future World. One entire wall of the restaurant consists of a glass window that is eight inches thick and that provides a view into an aquarium. While they eat, restaurant guests are able to watch tarpons, sharks, sea turtles, stingrays, groupers, and sometimes scuba divers in the six-million-gallon aquarium. Artist Kim Minichiello painted the underwater scene that appears on the restaurant's menu covers. Ron Douglas's cookbook America's Most Wanted Recipes: Just Desserts includes two dishes from the Coral Reef Restaurant: the Baileys and Jack Daniel's Mousse and the Chocolate Wave Cake. Coral Reef Senior High School is a secondary school located at 10101 S.W. 152nd Street in Richmond Heights, Florida; its principal is currently Thomas Ennis. Coral Reef is locally known as "Miami's Mega Magnet School" since it offers six different magnet programs. According to Newsweek's list of the 1,000 Top U.S. Schools in 2008, the school was ranked at 19th in the nation, making it 4th in the state of Florida at the time. In 2007, 2006 and 2005, it had ranked 22nd, 29th and 13th, respectively. This ranking is based on a ratio devised by Jay Mathews, which takes the number of Advanced Placement or International Baccalaureate tests taken by all students at a school in that school year and divides it by the number of graduating seniors. Coral Reef is currently ranked No.134 of the top high schools in the nation.The school does not primarily serve the surrounding neighborhoods, but instead takes applications from middle school students all over the county. Selection is done via a lottery system for all magnet programs except for Visual & Performing Arts, for which acceptance is based on ability; students must audition for this program. Most students living around the Coral Reef area attend Miami Palmetto Senior High School or Miami Killian Senior High School. Coral Reef has received an "A" grade for its performance on the FCAT examination on ten occasions since the annual test was first administered in 1998.Coral Reef has three publications: the newspaper, Baitline, their yearbook, Tsunami, and the school's literary magazine, Elysium. The newspaper is published monthly while the yearbook and literary magazine are both published annually. The daily morning newscast, CRTV Live (originally known as Cudavision, and later adapted to include the channel number as Cudavision 21), airs on closed-circuit channel 21. Coral Reef has six different magnets: International Baccalaureate, Health Sciences, Business & Finance, Legal & Public Affairs, Agriscience & Engineering Technology, and Visual & Performing Arts. to live but begin to starve after bleaching. Some corals recover. Above-average sea water temperatures caused by global warming is the leading cause of coral bleaching. According to the United Nations Environment Programme, between 2014 and 2016 the longest recorded global bleaching events killed coral on an unprecedented scale. In 2016, bleaching of coral on the Great Barrier Reef killed between 29 and 50 percent of the reef's coral. In 2017, the bleaching extended into the central region of the reef. The average interval between bleaching events has halved between 1980 and 2016. 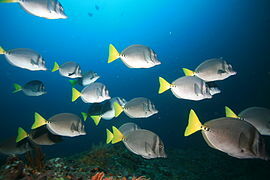 Coral reef fish are fish which live amongst or in close relation to coral reefs. Coral reefs form complex ecosystems with tremendous biodiversity. Among the myriad inhabitants, the fish stand out as colourful and interesting to watch. Hundreds of species can exist in a small area of a healthy reef, many of them hidden or well camouflaged. Reef fish have developed many ingenious specialisations adapted to survival on the reefs. Coral reefs occupy less than one percent of the surface area of the world oceans, but still they provide a home for 25 percent of all marine fish species. Reef habitats are a sharp contrast to the open water habitats that make up the other 99% of the world oceans. Coral reef protection is the process of modifying human activities to avoid damage to healthy coral reefs and to help damaged reefs recover. The key strategies used in reef protection include defining measurable goals and introducing active management and community involvement to reduce stressors that damage reef health. 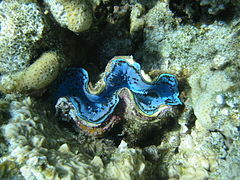 One management technique is to create Marine Protected Areas (MPAs) that directly limit human activities such as fishing.It takes approximately 10 thousand years for coral polyps to form a reef, and between 100,000 and 30 million years for a fully mature reef to form. John Pennekamp Coral Reef State Park is a Florida State Park located on Key Largo in Florida. It includes approximately 70 nautical square miles (240 km²) of adjacent Atlantic Ocean waters. It was the first underwater park in the United States. The park was added to the National Register of Historic Places on April 14, 1972. The primary attractions of the park are the coral reefs (such as Molasses Reef) and their associated marine life. Reef Check is an international non-governmental organization dedicated to the conservation of two reef ecosystems: tropical coral reefs and Californian rocky reefs. The Foundation is headquartered in Los Angeles, California, United States, but uses data from volunteer scuba diver teams in over 80 countries, ranging from Australia, Japan, to even Germany. It is the United Nations’ official coral reef monitoring program. The clear waters surrounding Saint John support a diverse and complex system of coral reefs. The health of these reefs is closely tied to its component plants and animals as well as adjacent non-coral marine environments such as sandy bottoms, seagrass beds, and mangrove forests. Seeking to provide greater protection to the sensitive coral reef resources, President Clinton established the Virgin Islands Coral Reef National Monument on January 17, 2001. The monument includes 12,708 acres (51 km2) of federal submerged lands within the 3 mile (5 km) belt off Saint John, including Hurricane Hole and areas north and south of Saint John.